If you are asking yourself how this is an infused water instead of a flavored tea, the short answer is that you use only a tiny amount of black tea in the recipe. 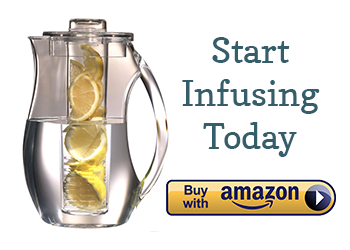 Remember, infused waters are supposed to be waters with natural flavorings. As soon as you add a lot of tea or fruit juice, then the drink becomes tea or fruit juice! Recipe for a 32 oz container: 7 organic raspberries + 1 teaspoon loose black tea or 1 tea bag. Slightly muddle the raspberries to release their juices. You can infuse at room temperature for 2-4 hours or chill in the fridge for 12-24 hours to get the best flavor out of the raspberries. After infusing at room temperature, strain the raspberries and tea, then keep your infused water in the fridge until you are ready to drink it. If you use loose tea leaves in this recipe, you will need to strain them before drinking. You can do this with a simple mesh strainer. Could you go into a little more depth on this one? one of your other recipes using raspberries says it can be done at room temperature for 4 hours or overnight. However, this particular recipe says it takes 12-24 hours being chilled to get the best out of the raspberries. So does that mean a combination of room temperature time and then chilled? Hi, Scott. This is an old recipe that desperately needed some clarification – thanks for bringing it up! 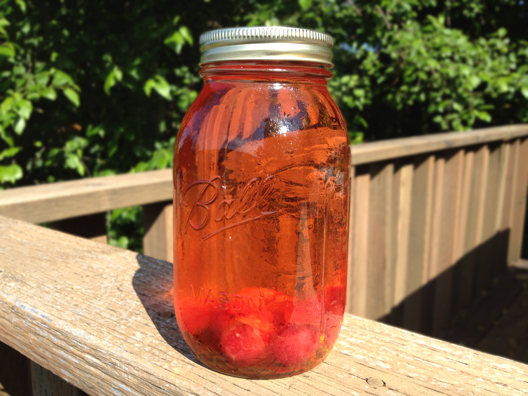 Raspberries are tricky to infuse because their water-tight skins keep the juices inside. You will want to slightly mash the raspberries to break the skins. Then, you can infuse at room temp for a couple of hours (which speeds up the release of the juices and flavors) or you can infuse for a long time in the refrigerator. You don’t need to do both methods, but if you infuse at room temp and don’t have time to drink the water, you will need to keep it chilled in order to avoid potential mold from forming. I hope this explanation helps. Thanks again for commenting! So for starters, I was so happy to see that this recipe existed. But i am curious about something. Would this work with tea bags too?